This dynamic programme is a new British-Chinese cultural collaboration exploring where classical meets contemporary dance, showcasing the extraordinary talents of Chinese prima ballerina Yuan Yuan Tan, principal dancer with San Francisco Ballet and Taiwanese virtuoso Fang-Yi Sheu. The evening includes three UK premieres choreographed by Taiwanese-born American Edwaard Liang, and Sadler's Wells Associate Artists Russell Maliphant and Christopher Wheeldon. "Classical, modern ballet, and modern dance in one show. With various dance languages, it is a special night of a special cross over performance "
Finding Light, choreographed by Liang, is danced by San Francisco principal dancers Yuan Yuan Tan and Damian Smith. Wheeldon's Five Movements, Three Repeats is centred around the luminous music of Max Richter and features a cast of four dancers, including Clifton Brown, former principal dancer at Alvin Ailey American Dance Theater. Russell Maliphant presents a new solo work  PresentPast, which was specially created for Fang-Yi Sheu, with lighting design by Sadler's Wells Associate Artist Michael Hulls. The evening also features two seminal works: Wheeldon's After The Rain and Maliphants Two x Two. The evening premiered in Beijing last year and is a co-production with the National Centre for Performing Arts Beijing, Ballet Star Foundation Beijing and Sadler's Wells. Originally produced as part of Crossing Continents, a co-production with Sadler's Wells, Beijing Morning Ballet Star Foundation and National Centre for Performing Arts, Beijing. 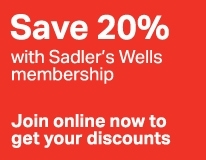 The Monument Trust supports co-productions and new commissions at Sadler's Wells.